Toenail fungus, known by foot specialist as Onychomycosis, affects about half of all Americans by the age of 70. It is relatively rare in children, but the incidence increases with age. Fungal infections occur when microscopic fungi gain entry through a small trauma in the nail, then grow and spread in the warm, moist environment inside the patient’s socks and shoes. Fungal infections can affect the fingernails as well as the toenails, but toenail fungus is more difficult to treat because toenails grow more slowly. It occurs most often on the big or small toe but can occur in any toe. Other risk factors include abnormal PH level of the skin, not drying off the feet thoroughly after bathing or exercise, and a compromised immune system in someone who has been exposed to a fungus. 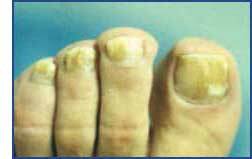 Diabetics have an increased risk of contracting a toenail fungus because their immune system is compromised. They should have their nails cut and debrided by a foot specialist on a routine basis. Wash your feet regularly, and dry them thoroughly when they get wet. Wearing nail polish on the toes is not advised because it can seal fungus in and allow it to grow. Keep toenails trimmed, and be sure to disinfect any pedicure tools before using them. If you do develop toenail fungus, see your foot specialist. The specialist might remove as much of the nail as possible by trimming, filing or dissolving it. Medicated nail polish might be prescribed for a localized infection, but a serious infection will likely be treated with an antifungal medication or topical creams. In some cases surgical removal or laser treatments are necessary.